Today’s drink comes once again from B. Neal. He’s given us a wide variety of drinks, from the very good… to the very horrible. 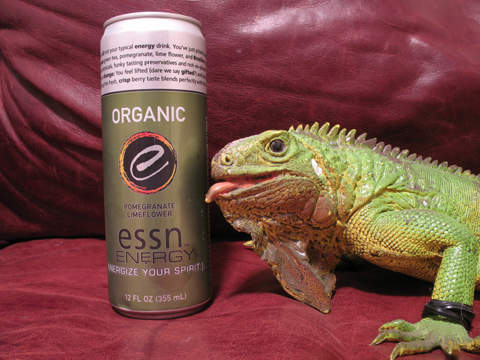 Let’s hope this drink, ESSN Energy – Pomegranate Lime flower, is the prior. The 2nd largest word on the can is “Organic” so they seem to think pretty highly of the fact that this is indeed an Organic energy drink without “those chemicals, funky tasting preservatives and not-so-pleasant jitters.” We’ve had an all natural energy drink before by Reed’s, and it was surprisingly good. Here’s hoping once again. Let’s open it up. I’m immediately scared because it smells like lime (good), flowers (good, good), and airplane glue (what?!). Against my better judgment, it’s time to drink. Ok, while it may be totally organic, it tastes like it’s made of chemicals. Airplane glue perhaps? The side of the can mentions how well the “crisp berry taste blends perfectly with the lime flower.” I’ll tell you right now that if it truly is blended perfectly, then they never should have been blended in the first place. This is one of the most vile energy drinks I’ve ever had the opportunity to taste. It wouldn’t be so bad if the side of the can didn’t brag about how much better this tastes than chemical filled drinks. It tastes to me how acetone smells, and I refuse to drink any more of this. Now I’ve had this in my fridge for a while, so I’m going to check the “drink by” date on the bottom of the can to make sure I didn’t judge this in haste. Ok, it does say “Best by April 2010” so by their standards I’m in the clear. The only positives I have for this is that the can is a nice color, and it’s not as bad as Malta Hatuey (but garners the same score)…so, hooray?